The first Vigilante was a western superhero who made his debut in 1941, and was fairly typical of his ilk - he wielded a pair of six-shooters, wore a red hanky as a mask, and battled such legends as the Dummy and the Rainbow Man. The latter's a colour-themed criminal, by the way, not just an example of the 1940s demonizing gays. He eventually settled down to run a ranch, and was eventually killed when the voices in Grant Morrison's head told him Seven Soldiers of Victory #0 needed a bunch of heroes getting slaughtered to get people's attention. Which just goes to show how badly drugs can mess up your perceptions - the (sadly late) Whip's costume did that by itself. As a district attorney, Adrian Chase grew weary and frustrated by the limits of the law. When a firebomb killed him and his family, Chase, dead for seven minutes, was reborn as the Vigilante - remorseless enemy of crime. As the Vigilante, Chase blurs the line between hero and villain, deliberately executing his enemies and becoming more and more reckless. His former friends want to help Chase, but he himself says that Chase is dead. Only the Vigilante remains. This figure (which the above bio of course describes) is the second Vigilante, since you can tell by looking at him that he wouldn't make it very far in the West before being beaten up by drunk ranchers over his fashion sense. Marv Wolfman and George Perez did the honours of reinventing Vigilante in 1983 in New Teen Titans Annual #2, which may well have been in Marc Andreyko's mind when he came up with the current Manhunter, Kate Spencer, who's also a DA who got fed up and donned fetishwear to do what the law couldn't (although in her case no familial tragedy prompted her - she just got sick of losing cases; not a woman you want to mess with). At least she didn't dress up like a scuba diver; then again, her series dwindled from a promising start down to an attempt on the world record for the number of cancellations it takes a comic to finally end, whereas Chase's 50-issue run in his own title, while not one of the classics, makes for interesting browsing. 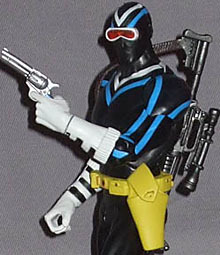 Vigilante is pretty much typical of all his race as a Mattel DC figure - a standard body, painted as near to the proper costume as possible, with a few add-on bits pushing him the rest of the way. That's not meant as harsh criticism, though, since a lot of superhero comics do tend to just re-use the same bodies over and over again. I fancy though that the upper torso is a slightly slimmer model than the one used for Mr. Terrific and Commander Steel, but male figures aren't my forte so the exact ins and outs of DCU's body types escape me. Vigilante has sculpted boots (generic boots though, the black bands on their backs are just painted), gloves with ribbed bands around the tops, and a nondescript utility belt with a holster on one side, and otherwise it's just the usual suspect "slender" body with a bit of paint slapped on for detail. The stripes are clean, but - on mine at least - the ones on the torso front are a bit too high, making them miss joining up with the stripes on the shoulders unless you raise the arms (which throws the back stripes out of whack). It's not a glaring error - stripes on articulated figures are always tricksy, so it's unremarkable to see them a bit off here and there. Vigilante's face is covered by a mask with built-in goggles, and unless I miss my guess there are actual eyes underneath it - the visor is transparent red, and obscures whatever's inside quite a bit, but there's something in there at any rate, so good effort there. The rest of the mask is sculpted quite well also, with molded lines for the stripes, and a good representation of cloth pulled over a face, with the shapes of the ears and nose and chin visible. Paint again suffers a bit, with the white stripe off-center. There's nothing unusual in the articulation layout: balljoint neck, swivel/pin shoulders, swivel biceps, pin elbows, swivel wrists, pin sternum, swivel waist, swivel/peg hips, thigh swivels, pin knees and pin ankles. As an action figure intended for action, he's good enough to pass muster. Adrian scores himself a trio of accessories, all guns. His holster can be opened are resealed easily, and contains a blue-handled revolver, and in addition he's got an assault rifle with a scope and an Uzi, both of which he's packaged holding, with the inevitable result that the rifle tends to be bent slightly on arrival; in my case, the scope droops. Vigilante's right hand is a standard accessory grip, suitable for the Uzi which has a plain handle; the left hand is sculpted for a firearm, with an extended forefinger, and fits either the rifle or the pistol, both of which have triggers and closed trigger guards. The rifle's strap allows it to be slung over his shoulder, but if you go for having it diagonally across his chest it's a bit of a tight fit, and the rifle can sit up awkwardly off his back. Like Commander Steel, Vigilante's packing tray has little logos molded into it, besides the Vigilante-sized hole - crosshairs in this case. The BAF bit this time is Giganta's left leg, which of course mirrors her right in most respects. Unfortunately, the upper and lower thighs aren't quite the same colour - that was also the case with the right, but not to a really noticeable degree, whereas this one is. Having the swivel cut right across the vastus medialis (the muscle poking out inwards above the knee, thank you wikipedia), which is kind of pointy rather than smoothly curved anyway, creates a bit of an illusion that the parts are mismatched. With the thigh swivelling on the hip ball anyway, it's a shame it wasn't all one piece. So that's Vigilante - and, unless Mattel goes and does another female "Collect & Connect" (ugh) figure, the last DCU male I'll be reviewing. He's not really a superstar, but from what I've picked up about the character, I can't see how this figure would be a disappointment - it looks like it should, moves well, and is armed like it should be. If only Mattel would remember that Australia exists and ship some product here, I might start thinking quite favourably on this line as a whole.